We wanted to share a paper written by a college student and AMRA member we recently met in Sonora. Thank you Mariesa for your hard work researching and writing this paper! Destruction, pollution, and a lack of respect for the environment these are just some of the things environmental groups like the EPA and Sierra Fund would like the public to think of when they see suction gold dredges. If you are not familiar with suction gold dredges, they consist of a suction hose, a small motor mounted on top of floating pontoons, and a sluice box attached to the back of the motor and hose. Generally, they also have a respirator for the operator to breath underwater. The water and gravel travel up the hose, through the sluice box and back out into the water, cleaner than when it was extracted with the hose. In other words, nothing is added or dumped into the water. Sand and fine material are left in the sluice to be further sorted at the end of the day. Gold, Mercury, Lead and other metals and heavy debris fall at the top of the sluice to be collected and removed. What a picture they are painting for the public, a picture based off of out of context information and lack of scientific proof these groups use to manipulate the laws of the state of California into banning suction gold dredging in order to support their own agenda, rather than having any authentic concern for the environment. For what reason, simply to gain control over public land use and to gain funding from taxpayers to continue restricting our rights. The permitting process was not only sufficient, but it was beneficial to the state’s economy. If anyone believes this situation will stop with suction gold dredges being outlawed they are mistaken, it will only be the beginning. California’s ban on suction gold dredging should be lifted without further restriction of the permitting process, because it creates new habitat for fish, it removes trash and 98 % of Mercury left behind by historic mining methods, it causes low amounts of turbidity, and because of the negative impact the ban has had on the state’s economy and mining communities across California. According to groups in opposition of suction gold dredging the fish are unable to spawn properly while dredges are in operation on the river. Suction gold dredging is “destroying sensitive wildlife habitat” according to Jonathan Evans with the Center for Biological Diversity (Targeted News Service,2013). These groups have so far been successful in the crusade against mining through tactics such as claiming fish species like the Coho salmon have not been studied, when in fact they have published an entire book on the species in 1989 (Western Mining Alliance, 2013). In looking at the spawning months of the Salmon species in question, the months are (depending on location and species) November through March (wildlife.ca.gov, 2018). The suction gold dredging season is typically a three to four-month period lasting from spring to fall, according to Shannon Poe (2014) of the American Mining Rights Association. This is evidence of no interruption of the spawning season, leaving me to question why this was ever considered part of their evidence against suction gold dredging. Witnessing first-hand that fish swim around the dredges, I was never able to consider this a significant argument on their behalf. I have found evidence that supports another story. According to a study done by Chui and Suen (2016) “dredging activities can actually improve fish habitat”. Suction gold dredging turns over rock on the bed load of the river, stirring small organisms that fish might consider sustenance. According to retired EPA and physical scientist Claudia Wise, after the gravel leaves the dredge and settles for one year it becomes “refugia” and fish will begin using the location to spawn (Jones, 2012). The spawning salmon can produce thousands of offspring at once, so even a few lucky enough to survive can benefit the population of that species. Dredging activity does not affect the fecundity (average number of eggs released) by female salmon. If the permitting plan were to continue as it was, there would be no effects on fish spawning since the seasons are offset. Flooding of the rivers in Northern California bring destruction to roads, infrastructure, and to fish habitats as it resets the bed load of the river each year. Dredging is a safe and healthy method of returning these fish “refugia” to a more suitable habitat after the flooding process. Along with these benefits, the great part of suction gold dredging is the removal of objects from the river that may eventually harm fish. Why should we even consider banning or further restricting an activity that is an income to the state, an ideal tool for creating habitat, it cleans the river, and it is privately funded by the miners rather than by the state and taxpayers. According to articles I have read in opposition of suction gold dredges, they are responsible for leaving trash along the river and dumping large amounts of mercury into the waterways. They have in some article gone so far as to say that gold miners are bathing in the water. While evidence cannot be provided to assure no bathing is taking place, I can honestly say I have not witnessed it within the mining community. An article posted by the AMRA “Small-scale Gold Suction Dredging” provides insight into just how much trash can be removed by suction dredge operation during one season (Greene, 2014). During operation, dredging frequently removes hooks, lead sinkers, and other fishing accessories. When I look at the photos at the end of this section, I find it extremely hard to see things any other way, suction gold dredging is cleaning our waterways. Mercury is a toxin found in nature, a common belief is that mining activities are responsible for all of the mercury found in our water. The fact is, before judgement is passed the public, EPA, and other environmental groups must understand that modern placer gold mining is very different from historic and hard rock mining methods. Let me start by explaining that two different methods of gold mining are practiced, Placer gold mining and hard rock mining. Hard rock mining is the extraction of gold from the ore it is found in underground. According to Nicholson (2017) this method uses Mercury in order to separate the gold from the ore. Placer gold mining such as dredging is used on the water using a hose to “vacuum” the river bottom, it cleans and sorts particles leaving the larger gravel to re-enter the river. No Mercury or any other type of pollutant is used in this process of gold extraction because gold is already removed from the ore by erosion processes. A report done on Mercury removal by suction dredge states that they remove 98% of Mercury from the material processed according to the California Water Board (2005). How can suction dredging be polluting the waterways, when evidence shows that suction dredging and the gold mining community are showing real effort to clean up the rivers they spend time on. Groups like the AMRA are putting fourth photographic, undeniable evidence that suction gold dredging is not capable of generating this volume of trash and Mercury. If Mercury needs to be cleaned up from our waterways, why not let the suction dredge operators do at no cost to the state. It is the ideal tool for removing the Mercury left behind by the historic mining methods, solely due to the amount it is capable of removing. Suction dredging causes large amounts of turbidity in the water, according to environmental groups. Turbidity is small particles of silt and clay, organic and inorganic material that gets stirred up temporarily in the suspended and dissolved load of the river. The river has natural processes for removing these particles, as well as other pollutants from the water without any aid from outside sources. Turbidity is a natural process caused by various natural sources like landslides, lahars, mudflows, and floods. Even smaller activities create corresponding small amounts of turbidity. The river has a self-purification process which settles this turbidity shortly after it leaves the suction dredge. The river can influence the self-purification process through mechanical, physical, chemical, and biochemical processes (Lazardou, 2013). Another words the river can dilute the turbidity caused by dredging very quickly and without harming the ecosystem. The river is capable of handling severe floods every year which create the greatest amount of turbidity out of any process taking place on the river. Suction dredging creates far less turbidity, most of which settles out before reaching the next bend in the river channel. What is causing harmful turbidity is the dumping of pollutants into the water that are foreign to the rivers ecosystem, this is seen often in populated areas. Since dredges do not add anything to the material that is released back into the river, it cannot be harmful. The turbidity consists mostly of natural organic and inorganic particles that will settle out of the water normally. Another opinion I have reviewed was that the cost of permitting for suction gold dredging was not enough to cover the damages to the river environment. That suction dredging causes enough of an impact to warrant additional costs to the gold mining community. In 2008 an article on “The Economic Impact of Suction Dredging In California” the numbers speak to the economic loss these small communities are seeing, due to the ban on suction gold dredging. Taxes in California on mining claims alone in 2008 were $1,701,088. For supplies such as food, camping fees, and “other living costs ” the same year totaling at $31,590,741. Gas, oil, and Maintaining equipment for 2008 reached $15,162,992 (Harn, 2011). I have witnessed many small community shops and businesses having to close their doors due to the loss of this income. Mining generated income for many of these remote rivers. At the time the article was written, gold was worth $1,431.80 per troy ounce. For every three troy ounces found $15.13 million was added to the economy. 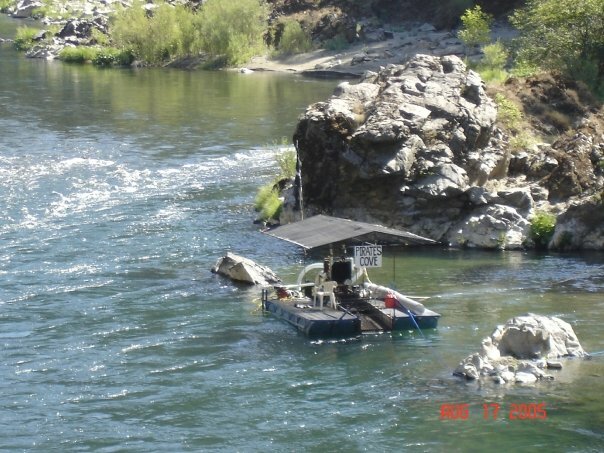 Many of the suction dredge operators are retired from work, doing what they loved to do and making a difference in the river at the same time. Since the ban many of these people can no longer operate a dredge or in some cases go mining at all. It is a terrible tragedy that these good people had the last seasons of a hobby they had such passion for stripped from them in the blink of an eye. Meanwhile, the EPA is proposing to study the Mercury content of the rivers in detail at the whopping cost of roughly 6 million (to start). Why are we supporting these groups who continue to ask for money, without showing authentic results. Studies have been done on the Mercury, I fully believe it is time to act on the clean-up. Something suction gold dredging has been doing for years. The truth is if the environmental groups succeed against suction gold mining, then many other activities are open to the same or similar types of manipulation and scrutiny. Mountain biking for accelerating erosion along the slopes of the trails, Fishing for the hooks, sinkers, and other debris they have left behind, or even the many asphalt roads we pave through wilderness destroying wildlife habitat. The point is where does it stop, when will the line be drawn? Suction dredging is both safe and helpful for the environment, and it is beneficial to the economy. A perspective I must share with my readers is that without mining there would be no Gold, Steel, Aluminum, or any other metals. Cell phones would not have the material needed to transmit signal, vehicles would not exist as we know them, none of our tools for work, and none of our “toys” for enjoying recreational activity would exist. Do we really want to attack suction dredging, I believe the answer is no. When it comes down to it, there is no reason to continue this ban. There is also no reason to change or rewrite the permitting process. I believe with this evidence anyone can agree. Suction gold dredging does not disturb fish, it can restore necessary “refugia” and benefit fish in all life stages. Mining groups and suctions dredge operators are the only ones making true effort to clean-up the rivers, removing trash and collecting Mercury that is toxic to people and ecosystems. Any turbidity caused from dredging is taken care of by a river’s various ways of self-purification. California’s suction dredge ban should be lifted, and the permitting process returned to its previous conditions. We should not allow groups like the EPA and Sierra Fund to manipulate our government to fit their wants and needs, nor should we pay them to do so. Continuing to grant money for “improving the environment” is taking money away from other projects in the state, like replanting wildfire areas and homelessness. The EPA takes this money and uses it to sue dredge operators in court and get more funding, when are they going to actually do anything they have been paid millions to do? I believe we should do away with the EPA Mercury project, and use that money to get dredges on the water to actually clean up the toxins instead of just study them. Lazaridou, P. (2013). River Water Quality. Retrieved September 23, 2018. Western Mining Alliance. (2013). How they banned dredging. Western Mining Alliance,15-15. Retrieved September 23, 2018.